In going through the drafts folder, I found this mini book review which just needed a picture and some links. I must confess that Mom has been buying books like crazy at consignment sales where they're often just a couple dollars for multiple books and we haven't been to our local library in months. As the weather becomes consistently nicer, hopefully the Blueberry and I will start making regular trips. 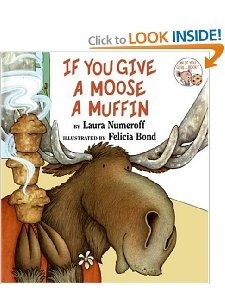 If You Give a Moose a Muffin by Laura Numeroff (New York: HarperCollins, 1991) is from the same author as If You Give a Mouse a Cookie which we read last June and very much enjoyed. In this story, rather than a cute little mouse, the visiting animal is a huge moose. Tempted into the home by a boy who offers him a muffin, the moose soon makes himself quite at home, asking for the boy's mom's special blackberry jam, then more muffins. When the boy agrees to make more muffins, a trip to the store is first required and naturally the moose wants to go along. However, first the moose needs a sweater, then needs to sew a button, then make finger puppets and so on. It's quite hilarious with colorful illustrations to engage any early reader.